Are you looking for a microSD memory card to increase the storage on your camera, phone, tablet, drone, computer, or something along the lines of a Nintendo Switch? If you haven’t been paying attention to the MicroSD memory card market, you might not be aware that storage capacities have continued to grow and we now have 512GB and even 1-terabyte microSD cards available for purchase. Today, Legit Reviews will be taking a look at the Samsung 512GB microSDXC EVO Plus that was introduced in February 2019. With up to 100MB/s Read and 90MB/s Write speeds this card with Class 10 speeds and U3 compatibility is ready for 4K content. Not all memory cards are rated for 4K video capture and Samsung recommends only the 64GB cards or higher for the best 4K UHD video support. 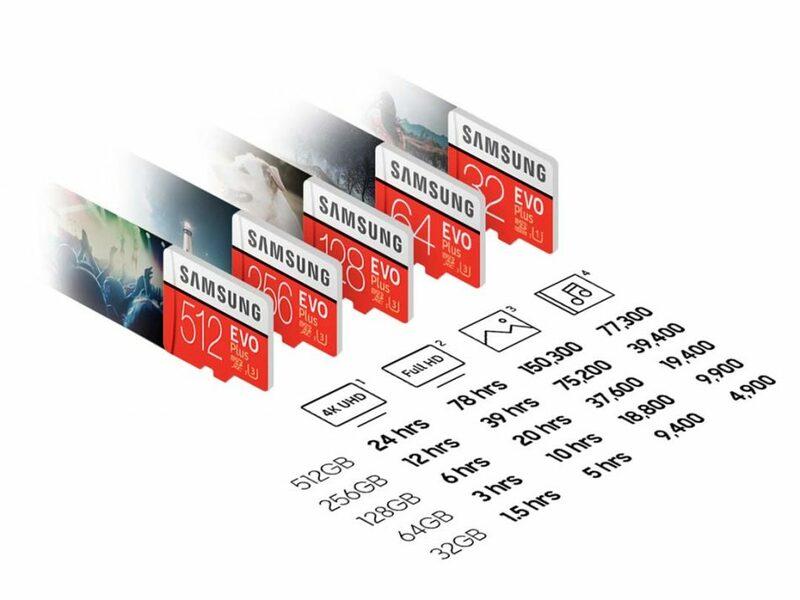 The Samsung EVO Plus microSD series is currently available in 32GB, 64GB , 128GB, 256GB and 512GB capacities. Pricing starts at just $6.00 shipped for the 32GB, $13.85 shipped for 64GB, $24.00 shipped for 128GB, $45.99 shipped for the 256GB card and finally the largest 512GB capacity memory card is $133.93 shipped. 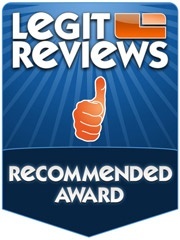 All are backed by a limited warranty of up to 10 years, so these cards are built to last. Samsung also says that these cards have 4-proof protection, which means that each EVO Plus memory card can withstand up to 72 hours in seawater, extreme temperatures (Operating temperatures of -25°C to 85°C), airport X-ray machines (Up to 50 Roentgen) and magnetic fields equivalent to an MRI scanner (Up to 15,000 gauss). The image above shows how many hours of 1080P and 4K video one can fit on each capacity as well as pictures and songs. The 512GB EVO Plus that we are taking a closer look at today has enough memory for up to 24 hours of 4K UHD video, 78 hours of Full HD video, 150,300 photos, or 77,300 songs. If you are looking to expand your Nintendo Switch game library beyond the 32GB of internal storage on that device you’ll be able to get dozens of games on this card. It really depends on what games you have as some titles like Zelda: Breath of the Wild alone take up 13.4 GB of storage space while other game titles like I am Setsuna only take up 1.4 GB of space. Dragon Quest Heroes I & II take up a combined 32 GB of storage space, so using a microSD card is ideal for serious gamers. Nintendo allows the Switch to support up to 2TB microSD cards. 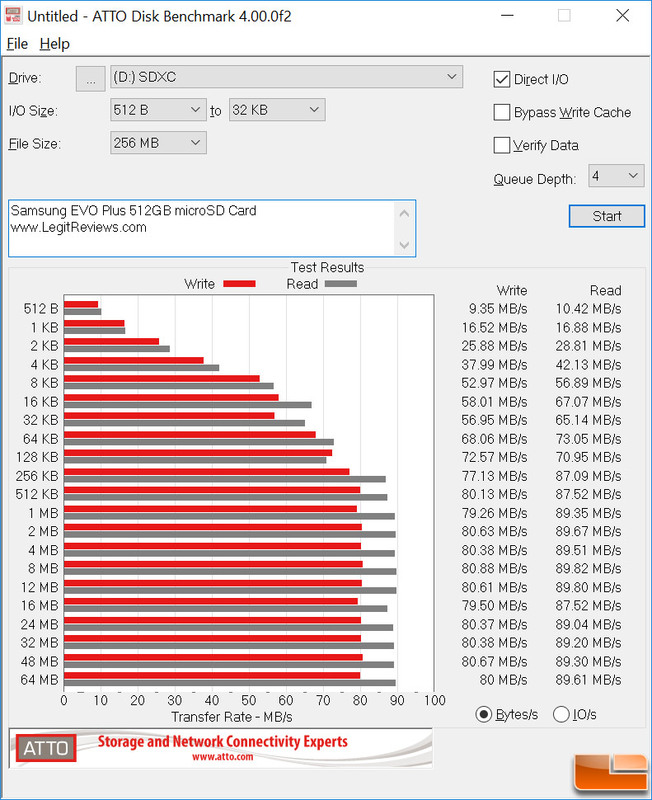 To test out the Samsung EVO Plus 512GB microSDXC card we used our trusty Dell XPS 13 gaming laptop with an 8th Gen Intel Core i7 processor for speed testing in the included SD adapter. The exact model number on the card that we are testing today is MB-MC512G. 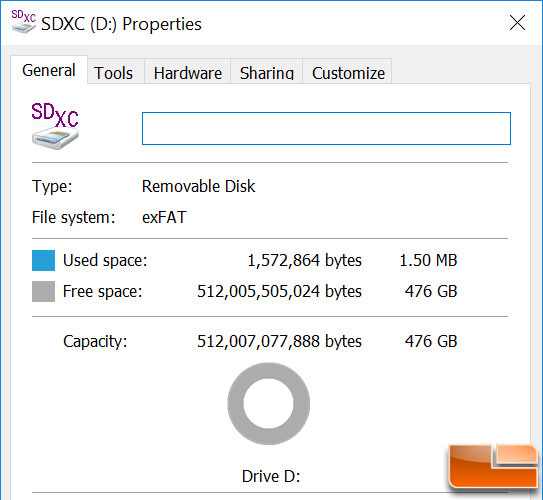 The card comes with the exFAT file system and in Windows 10 it shows up as having 476GB of free space. There are many fake memory cards floating around, so always buy online from a known good seller. Many online marketplaces are flooded with counterfeits, so you might want to avoid 3rd party sellers when trying to purchase an authentic memory card. Our first speed test was done using ATTO Disk Benchmark 4.00.0f2 and we topped out at 90 MB/s read and 81 MB/s write on the Dell XPS 13 laptop. This is just below the drives rated speeds of 100 MB/s read and 90 MB/s write. 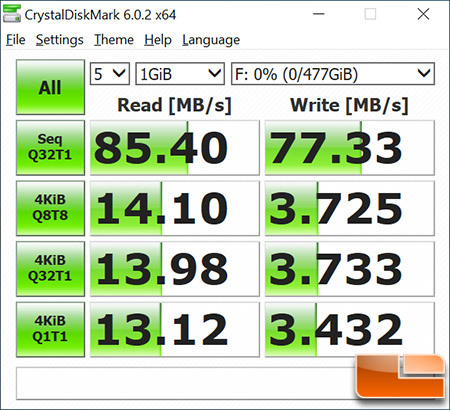 CrystalDiskMark 6.0.2 also showed that we were found that we were getting 85 MB/s read and 77 MB/s write. 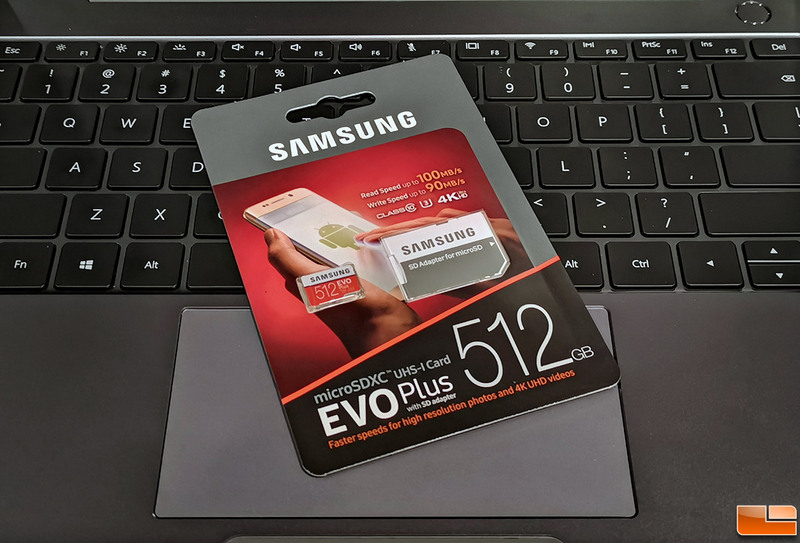 At the end of the day the Samsung EVO Plus 512GB microSDXC memory card allows gamers and content creators to bolster their devices storage capacity with ease. While we were not able to hit the top speeds on our devices, we came close and were more than happy with the upload and download speeds. This card is quicker than most and that means less time sitting around waiting for your content to be moved. It also goes to show that not all devices will be able to reach the drives rated speeds and that is why all manufactures use the words ‘up to’ when talking about performance metrics. The Samsung EVO Plus 512GB microSD card is available on Amazon for $133.93 shipped. That comes out to being $0.26 per GB, which is very respectable for a name brand card that is backed by a 10-year limited warranty. The SD adapter only has a 1-year warranty and the card warranty is not valid when used in dashcam, CCTV, surveillance camera and other write-intensive devices. Those minor warranty caveats aside, this still doesn’t feel like a bad price to pay for that much storage space and performance in a microSD card! Legit Bottom Line: Expanding storage space on devices with a microSD slots has never been easier thanks to large capacity cards like the Samsung EVO Plus 512GB!